This cake is a new recipe and it’s probably my favorite chocolate cake ever! It’s one of those batters where you wonder how it’s going to magically become a cake after some time in the oven because it’s so liquidy. So moist and tender, I can’t even tell you with words how good it was. 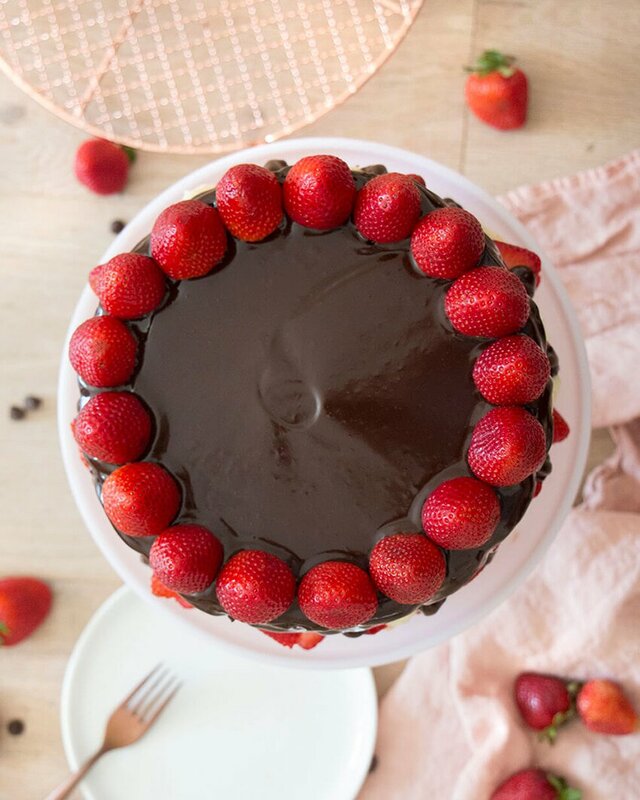 I paired the cake with lots of fresh strawberries suspended in a mascarpone buttercream and topped with a rich chocolate ganache. Heaven. You could make any kind of buttercream and it would still be amazing though, I’m not sure how many of you have mascarpone cheese at your local grocery store! 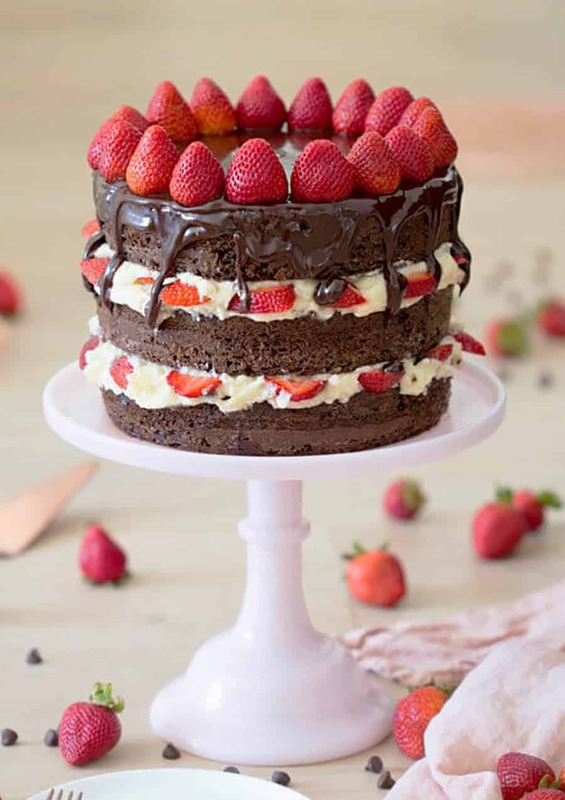 If I was making a sheet cake version of this (for ultimate ease) I would pile with whipped cream, drizzle ganache and top with tons of strawberries. You can’t use whipped cream for the filling of a layer cake though as it isn’t sturdy enough to handle the weight, just FYI. So this cake is my first post-twins baking experience. Did I mention that my husband and I had twin boys in May?? For all the parents who have ever commented on a cake and said “I wish I had the time” I finally get it! I thought I was being slick by making a simply decorated cake but it still took me much longer than expected when you’re trying to do things between feedings. If you’ve tried this cake then don’t forget to rate the recipe and let me know how you got on in the comments below, I love hearing from you! Make sure you don’t over-mix the mascarpone as it will become grainy,and make sure it’s completely room temperature before incorporating it. You can substitute whole milk yogurt for the sour cream if desired, I do it all the time and can’t really tell the difference. If you don’t have buttermilk then use whole milk with a tablespoon of lemon juice mixed in. To get FLAT layers that are moist inside and out try using cake strips! You can buy a set on the shop page or make your own from foil and paper towels at home. I made a whole blog post on it so check it out if you’re interested! What if you can’t find Mascarpone anywhere?!? A while back I was making a cake with a mascarpone buttercream and realized mine had expired! I didn’t have time to go to the market so I followed Nigella’s advice for a reasonable facsimile and mixed the following ingredients together until combined. Make sure they are all at room temperature! It’s not exactly mascarpone but it will do in a pinch! Sift the dry ingredients together and whisk until combined. Add the wet ingredients in a medium bowl and whisk together. combine the wet and dry ingredients together and whisk until well combined. The batter will be very runny but don’t worry! Add tot he prepared pans and bake are 350F for about 35 minutes or until the centers are springy to the touch. Cream the butter until it lightens and changes texture, at least 5 minutes. Beat in the confectioners’ sugar and pour in a tablespoon of cream. Add the mascarpone cheese and beat JUST until combined. If you over-beat the texture will loose it’s silkiness. I often fold the mascarpone in by hand. Pipe the frosting onto the cooled cake layer. Pipe some more frosting on top of the strawberries and add the next layer. Repeat steps 5-7. Pour your ganache on top of the cake and smooth with an offset spatula. I will often add a few drips on the edge for a messier look. 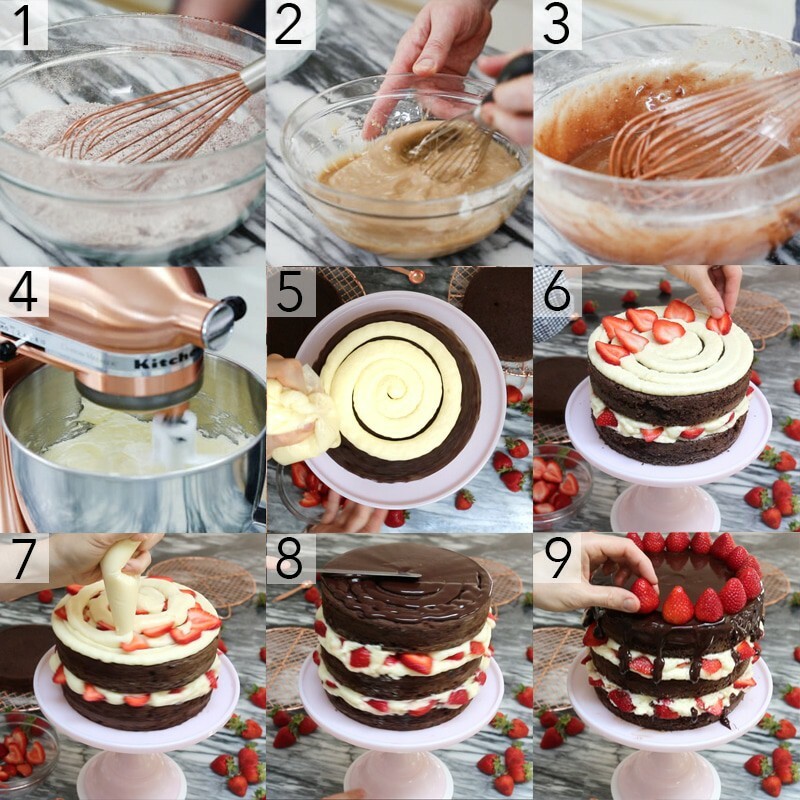 Add the hulled strawberries on top of the cake. You can brush them with some warmed jam for a glosser look if desired. By the way; this cake was GROANING under the weight of three layers. 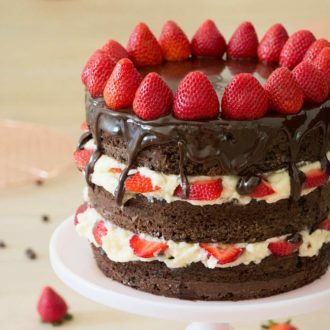 I’d actually recommend using some internal support if you try making this at home as the strawberries are a bit slippery inside the cake. Or you could make a two layer cake and a batch of cupcakes! 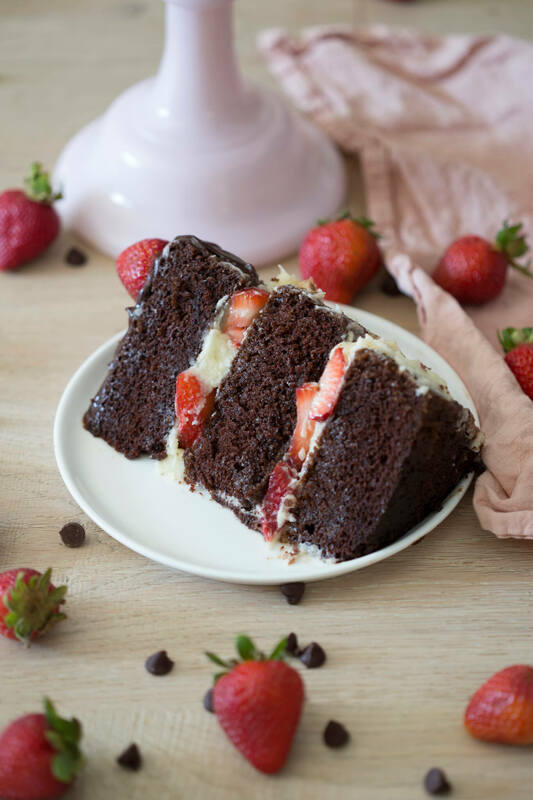 The most tender chocolate cake imaginable with fresh strawberries and a light vanilla mascarpone buttercream. Butter and flour 3 nine inch cake pans. I highly recommend using cake strips for a more even bake. Sift together the dry ingredients (including the sugar) into the bowl of a stand mixer and whisk to combine. Add the wet ingredients into a large bowl and whisk together. Add the wet ingredients the dry ingredients. Whisk to combine then mix on level 2 for two minutes. Distribute batter evenly to the three pans and bake for about 35 minutes at 350F or until a toothpick inserted in the center comes out clean. I recommend rotating the pans half way through the bake. Allow to cool for 10 minutes then invert onto wire racks to cool fully. Cream the butter until it lightens and changes texture, at least 5 minutes. Beat in the confectioners' sugar and pour in a tablespoon of cream. Add the mascarpone cheese and beat JUST until combined. If you over-beat the texture will loose it's silkiness. Scald the cream and pour over the semi-sweet chocolate chips. Cover and let sit for two minutes, then whisk until smooth. Make sure you don't over-mix the mascarpone as it will become grainy,and make sure it's completely room temperature before incorporating it. If you don't have buttermilk then use whole milk with a tablespoon of lemon juice mixed in. Can you tell me what are cake strips .im from the uk . Hi Corol — It is basically a wet fabric strip that you wrap around the pan. Thanks, John. Hi, is the baking time/temperature different if you make a sheet cake? Hi Shelley — Temperature will be the same. Depending on the size of the sheet, you’ll have to adjust the time. Check the center frequently to see when it’s done. Thanks, John. 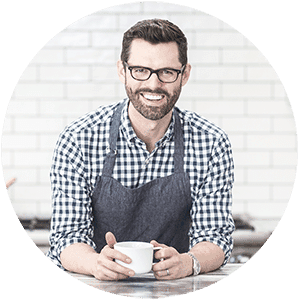 Would it still be good without the coffee and without the mascarpone cheese? Hi Jasmine — Sure, you can substitute the coffee but it brings the chocolate flavor. Also, you can totally use a different kind of buttercream and it will still be great. Let me know how it goes! Best, John. Hi! What would you substitute the coffee with? And can you make these into cupcakes? Use hot water instead of coffee! Hi the top of my cake and sides go hard and crusty how can I prevent this? Hi Ellis — I always use cake strips when I bake to prevent that very thing. You can buy them online, or make them. They’re basically a wet piece of fabric that wraps around the outside of the pan. Hope this help! Best, John. Hi. Pls can u mention gramms as well. I dont like to measure with cups. Thanks. I am working my way backward and adding grams to all my old recipes! the best chocolate cake ever,i loved it! Awesome! I’m so happy to hear that!